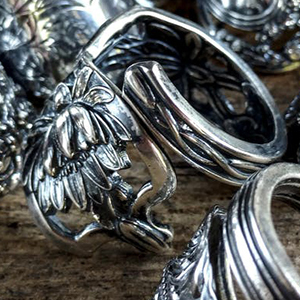 Learn how to make an heirloom spoon ring from family silverware or a flea market find. Spoons (or forks!) can be made of sterling silver or silver plated nonferrous metal. Bring in your silverware and we will use the traditional metal smithing techniques of cutting, filing, sanding, hammering, bending, and polishing to turn your old flatware handle into a new wearable ring. NOTE: Steel and stainless steel cannot be used. A selection of spoons will be on hand for purchase in case a student doesn’t have a spoon made of workable metal. Students may be able to complete more than one ring if time permits. Beginners with no jewelry making experience are encouraged to bring extra silverware in case they run into problems on their first attempt.